There are elections in Canada right now, and the niqab has suddenly become a pressing issue. A court recently ruled that governement cannot forbid women not to wear this (almost) occlusive veil for citizenship ceremonies. So far, the Conservative Party (in power) opposes women wearing it for the ceremonies as does the Bloc québécois (a separatist party on the federal level). The Liberal and New Democratic Parties, on their side, either avoid the question or actually support it, probably because of “multiculturalism.” It apparently played against them as the CP and the BQ surged in a recent survey. Let’s not kid ourselves: any religion requiring anyone (but women seem to be the prime target) to wear any garnment is repressive. It’s especially appalling for Islam, where religious “police” goes around town and fine/arrest women who don’t wear the proper clothes (not unlike what already existed in the U.S. not too long ago). If your ideas need guns to work, they are worthless. So as long as citizenship exists, people inside an arbitrary set of borders are free to decide what a citizen will look like. IF I wanted to become a citizen of Saudi Arabia, I would need to dress “appropriately”, while I would need to change my name in Iceland so it became “more Icelandic.” So in Canada, where legal equality between men and women is a given, not wearing a niqab to become a citizens makes sense. However, I feel a profound discomfort in actually making it a crime to wear those clothes. While it’s “obvious” that wearing a niqab is most likely due to coertion or brainwashing, wanting to ban it altogether is just as bad as imposing it. Unless we interrogate every women wearing the veil it’s impossible to know why they do. Besides, are there really that many of them in Canada? According to this blog (quoting from Statistics Canada), the city with the highest concentration of Muslims is Montreal with about 89,000 of them (out of a population of more than 1.5 million), and a sociologist estimates than about FIFTY women wear the niqab in the whole province. True, Muslim immigration is indirectly encouraged in Quebec because of language prerogatives (French). However before “they” actually invade us and impose sharia law, the Fed will be abolished and we will go back to sound money. 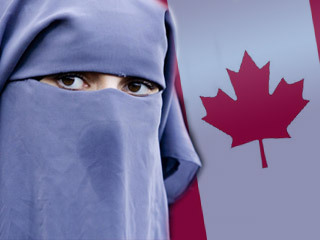 So while banning niqab during citizenship ceremonies would make sense in a “free” country, banning it altogether as some want is the antithesis of freedom. It may or may not be a choice by the woman, but it’s (unfortunately) her business and there is nothing we can do about it unless she complains in some way.